Yeah, we know, we delayed this as much as possible, but we can’t deny it any longer. Winter in Chicago is happening. To help you get through it, we’ve compiled this essential listing of all the events worth peeling off the Cubs Snuggie for as you make the best of the season. Hey, it could be worse, at least you don’t live in Canada. What better way to celebrate the new year than this React Presents two-day festival featuring pulsing electronic music from the likes of Zeds Dead and Dillon Francis paired with groovy hip-hop beats from Danny Brown and Smino? You could do worse than spending your New Year’s Eve at an arcade bar. Especially when JC Brooks & the Uptown Sound is lighting up the dance floor with a sweaty, funkadelic celebration. Instead of watching the ball drop, watch the Chicago star rise over Downtown with fireworks, live bands, a daytime 5K, and plenty of Corona in the “party zone,” plus satellite parties nearby at the Hyatt Regency, Hard Rock Café, and Howells & Hood. It’s the funniest 10 days of the year as sketch comedy groups from across the globe descend upon Chicago like a mad boozed-up Santa to gift the city with laughs. And it’s happening in the middle of winter. When you need it most. Check out the finest under-the-radar talent at this hipster-approved smorgasbord of indie bands (including local jazz icons Tortoise) and comedy (such as The Daily Show’s Michelle Wolf) at venues around town including Schubas, Lincoln Hall, Metro/Smart Bar, and The Hideout. Oh these guys? They’re just the WORLD SERIES CHAMPS. In the flesh. Get up close to your favorite players at this year’s Cubs Convention and geek out with a packed house of fans. This party is gonna last a while. 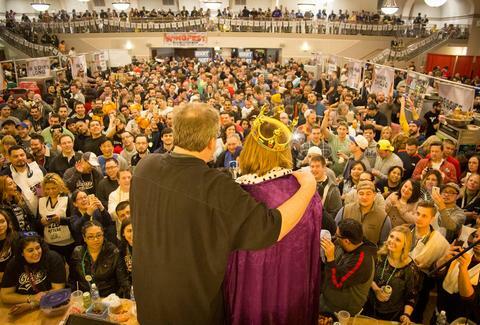 The changing of seasons may mean an end to Chicago street fests, but the beer fests continue to flow at events like Chicago Ale Fest, taking over Navy Pier’s Grand Ballroom with 150+ American craft beers, food trucks, and DJs spinning an all-vinyl playlist. Sample all you can handle coffee and donuts from the likes of Longman & Eagle, Beavers Donuts, Zombie Donutz, and Big Sweet Bites. And yes, uttering the phrase “mmm, donuts” is allowed. Peep some of the finest new cars in the industry (and the models who display them) at the country’s biggest auto show, and dress up in black tie at one of the fanciest nights of the year to kick things off at this year’s First Look for Charity. The details are still being sorted, but you can bet Chicago’s Best WingFest will be back in action with a randomly chosen selection of judges from the audience to blind taste test wings in four categories as you munch on as many of these delectable creations as you like. One of the coolest parties of the year heats up February with live body painting, all-you-can-eat pancake bar (yes, this is a thing), live bands, booze, and art. Now expanded to two days. That’s how hard of a party it is. Winter in Chicago wouldn’t be winter in Chicago without this epic urban race that will have costumed teams of five maniacally racing shopping carts full of food donations through the streets of Wicker Park/Ukrainian Village, with plenty of tomfoolery along the way. North Avenue Beach’s Castaways is the site of this annual celebration of shrinkage as the Chicago Polar Plunge looks to benefit the Special Olympics with three waves of plungers plus a post-race “meltdown party” inside the boat house. It may not be as crazy as it once was, but the Beverly parade is still one of the most iconic days of any Chicago year. And something to look forward to all winter long.